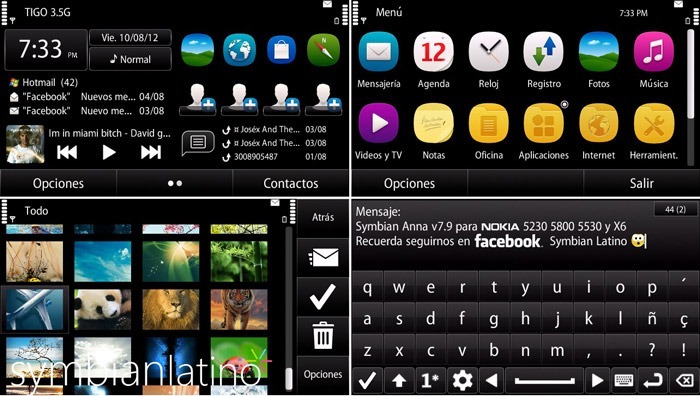 One of the best CFW's i have used obviously includes Symbian anna 7.5, but now there is a new Anna available (v7.9) so use it guys it will be awesome for sure, i take no credits for this CFW, i am just sharing this cfw with you guys. To celebrate we got to the 11,000 fans on Facebook, the last update CFW Anna Symbian for Nokia 5230 5800 5530 X6, so Symbian S60v5 officially say goodbye. This new version fixes all errors that we reported in the previous version, we updated all native applications to their latest version and after reading lots of documentation we present the best firmware we have created the most focused on the phone with a excellent handling of the RAM you will notice instantly, additionally you can enjoy all the features that have the new Nokia devices through the new Symbian v7.9 Anna. Corrected errors in the camera icon. Effects renovated with kinetic response. New Nokia Pure Source much more readable. Changes in the System Cache for applications to start faster. Thorough cleansing of the firmware to get more free space. But all the other advantages of the previous version v7 Anna. No it wont. Try the ones posted under your RM.